Garena is an online game and social platform. It has an interface similar to instant messaging platforms; it is a powerful app that allows you to connect with a global network of gamers. 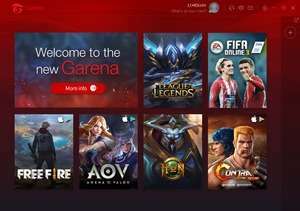 After installation you have to create and account to log into the Garena network. You will be assigned an avatar for identification within the community. Version 2.0.3231 is a freeware program which does not have restrictions and it's free so it doesn't cost anything. For security reasons, you should also check out the Garena download at LO4D.com which includes virus and malware tests. Additional screenshots of this application download may be available, too.